Sweet and savoury. Naturally caffeine free. Great taste 2018. What's special about this tea? Fennel has an anise like aroma and is used widely around the world for both culinary and health purposes. Importantly to us it tastes yummy and is particularly delicious with its partner in crime - liquorice. 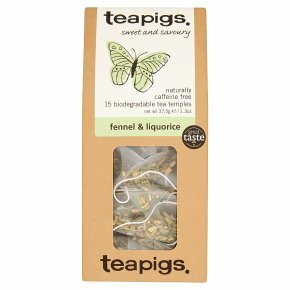 A naturally caffeine free, sweet and savoury, aromatic tea. Louise Our tea temples: We use quality whole leaf only, not the dust found in regular tea bags; whole leaf is best. A tea worthy of worship belongs in our biodegradable "tea temple" - our spacious, transparent mesh bag allowing maximum room for perfect infusion.